Wouldn’t you happily plunge into a pool of wins right about now? Yeah, we know it’s getting hotter by the minute and that’s why we thought it would be an excellent idea for you to cool off with a couple of mid-July bonuses and hundreds of FREE spins! Sunscreen lotions, lip balms, sunglasses and bikinis are all part of your mid-July essentials – and so is winning while playing our popular breezy Enchanted Garden slot with a 1st 100% Match and 50 Free Spins! 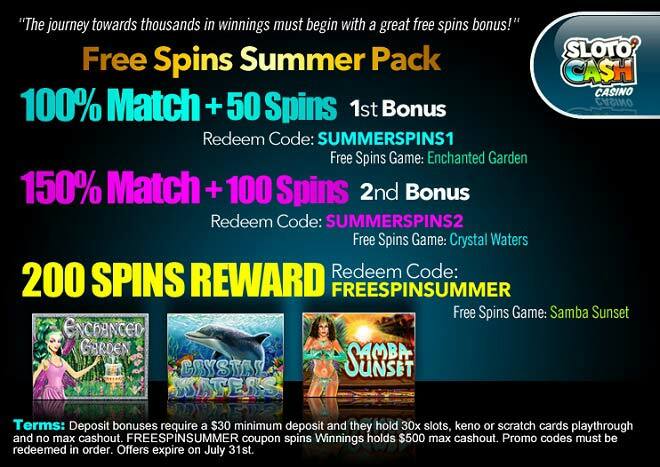 Continue lounging and relaxing the last few weeks of July while you soak up the sun and breathe in continuous wins with a 2nd 150% Bonus and a more than sizzling FREE 100 Spins! And shake your mid-July celebrations away with a vibrant, colorful and exotic good time when you collect an extra reward of 200 Free Spins that you can dance to while you spin our new Samba Sunset slot! Deposit $30+ today and raise the winning temperature of your last few weeks of July!